FLORENCE, Italy (VN) — Logan Owen just missed a podium spot in the world championships on Saturday. The American placed fourth in the junior road race, matching his finish in the cyclo-cross title fight — both times suffering at the hands of Dutch rival Mathieu van der Poel. Owen saw Van der Poel fly away going up the main climb to Fiesole, north of Florence. He sat back and thought about the silver, but was unable to find a clear path. He said that he was blocked when an Italian changed lanes. “I just missed the podium by maybe half a bike length,” he said. Doubts filled Owen’s mind. He considered the work of Team USA, how Zeke Mostov made a huge effort to put him in an earlier breakaway. There’s that name again. 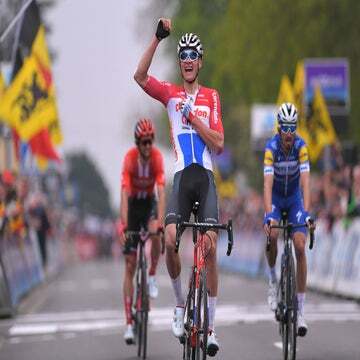 Van der Poel is the son of Adri, winner of the Tour of Flanders and Liège-Bastogne-Liège, and the grandson of Raymond Poulidor, five times second overall at the Tour de France. Van der Poel won the cyclo-cross world championships in 2012. He defended it this year in Kentucky, holding off Owen. Owen looked up at the clouds and over towards Fiesole. Van der Poel said that those ‘cross skills helped him deal with the technical descents. And based on what Owen saw from him this year, the American was not surprised when the Dutchman won.